It's hard to go wrong with a retelling, especially when you play it safe like Liesl Shurtliff has done. The elements of the original Little Red Riding Hood are cleverly woven into the story, but the original is pretty bare bones and so most of this story takes a wholly original approach. Red, as a character, is equal parts likable and forgettable. I'm fine with that, because that means I had a nice character to journey with along the story, but once the story was over we effectively parted ways. 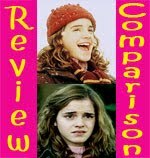 The side characters were developed similarly: nice and enjoyable during the story, but not memorable. The plot also followed that same path. It was just enough to keep me engaged, but not quite enough to stick with me after the story was over. I think the target audience will be even more engaged than I was, and the nifty quest-ish stops along the way will probably stick with younger readers more effectively. Though, there was this one scene along the journey that really has stayed with me. It was creepy, sad, romantic, and terrifying all rolled into one and could easily stand alone as a short story in its own right. For those who have read the book, I'm talking about the memory water scene. While most of the other lessons Red learns along the way are your standard fare coming of age, growing type lessons, this scene provided something meatier and more adult to contemplate. 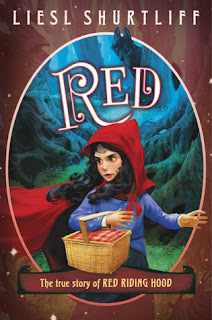 If Red is any indication, Liesl Shurtliff's series of standalone fairy tale retellings are a solid contribution to the genre that should appeal to the target audience of middle-graders, but also provide something for YA and adult readers. Recommended, especially for fans of authors like E.D. Baker. Looking for more like this? So, you can see how The Afterlife Academy doesn't really break new ground or stand out in any amazing way. But, it also doesn't stand out in any bad ways, either. 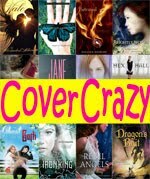 The characters, plot, and world were also fleshed out enough to hold the interest of an adult reader. This may sound like damning with faint praise, but I think the exact opposite is the case. This is a dependable book. The kind of book that will deliver a solid, fun story. 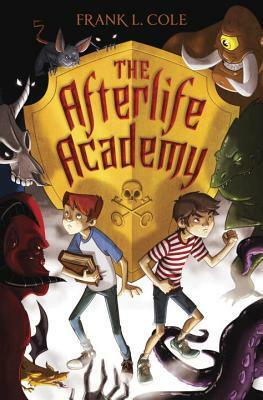 The Afterlife Academy is a good contribution that deserves a spot on gift lists and library shelves. This is a standalone, but it has a solid enough base that I could easily see it going on to become a steadily successful series. Recommended, especially for Rick Riordan fans. Oh Mary. This is not a happy story, though it is one sympathetic to Mary. 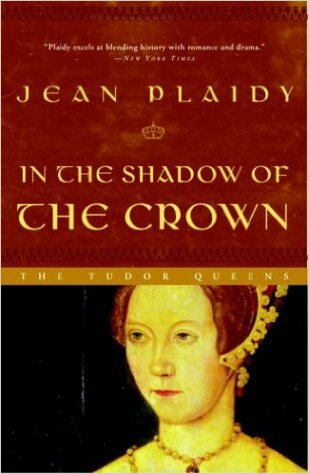 Plaidy starts the book when Mary is a beloved child and all is more or less well between her parents Katherine and Henry VIII. Anne Boleyn comes on the scene early on though, and of course it's all downhill from there. In typical Plaidy style, this is pretty much a rundown of events, complete with repetitive phrases, non-fiction-ish narrative, and thinly developed characters. All of which I'm ok with. 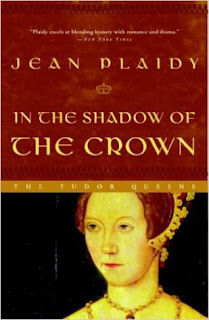 I already know this story and have read the events of Mary's life through multiple other books, so I'm not sure at this point how In the Shadow of the Crown would come across to readers unfamiliar with Mary's history. I didn't come across any cringe-worthy inaccuracies and the events seemed pretty balanced with good pacing though, as often seems to be the case, more focus on her pre-queen years. The queen years were where I was truly gutted and Plaidy broke out of her play-by-play style and actually developed a character for Mary. This part was so hard to read because Mary is so hopeful and in love, and her husband and court are not at all nice to her. Watching her continually make a fool of herself, when all she wanted was someone to finally love her, was painful to read. My heart broke for her as she pinned her hopes on her husband, kingdom, and dreams for a child and then it broke further as she eventually came to terms with the realities of these situations. This part was well done. Plaidy has proven to be a solid historical fiction choice, and this was one of her better books. Mostly it's typical Plaidy, but she slowly grows Mary as an individual with the final chapters solidifying Mary as one of Plaidy's more richly drawn historical figures. Definitely recommended for Mary fans, but also for historical fiction fans in general who don't mind Plaidy's drier style. Well, be still my heart! 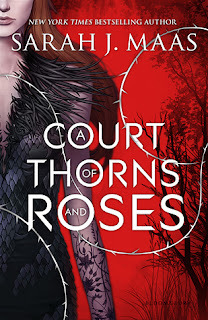 I was a little worried (ok, ok, I was A LOT worried) I wouldn't love this new series as much as I love the Throne of Glass series. I mean, it has fairies and stuff. Instead, I waited for a copy to come through inter-library loan. Which basically means I had to hide from the internet all during release week until my ILL copy finally came through because ya'll were blowing up internet with ACoTaR updates, reviews, quotes, and hypable squees. And, touche, you were all right. I should have just pre-ordered, because I'm totally buying a copy to put on my Special Shelf and re-read a million times. I know Sarah J. Maas is known primarily for her YA series and I think a lot of libraries are getting mixed up in their cataloging because of that. But this series? This is NOT a YA series. I've heard a lot of back and forth about the romance and whether or not it's wrong or swoony or we're wrong for swooning or not or, yeah, I'm not wading into that. I'll say this: I like it. Ok, so I couldn't help comparing Feyre to Celaena, and I'm sorry but I like Celaena a little more. That's not to say that I don't like Feyre, because I definitely do. It's just, Celaena has a...spark? She has something that Feyre doesn't. Feyre and Celaena are both so similar, but also totally different, which is a completely unhelpful description, I know. They both have fire and sass over a core of vulnerability, but Feyre is in some ways...harder? Darker? She also has a swaggering bravado and self-confidence that I can't help but love. She's Celaena Sardothien, and she will not be afraid. Feyre feels more beaten down by the grinding suckiness of life. Poverty, starvation, the bone-aching hurt and betrayal of a family that disappoints. Feyre's painful experiences aren't relegated to the world of fantasy and they seem all the more adult and crushing because of that. But, then I get scenes like the mud worm fight and suddenly Feyre goes from her regular likable but not entirely stand out self to someone who is awesome. And she's made all the more awesome for it because she isn't a trained assassin or some super-fairy. She's just a tough as nails survivor and THAT is what makes me like her so much. For the most part, all of the other main characters are men, and I can't decide which one I like more. They each bring something different to the table (think Marcello, Luca, and Lord Greco), and every one of them is a character who is interesting in his own right beyond romance. I want to know more about their histories. I want to follow them on their own adventures. I want to read from their perspectives. I want spinoff series. This is why I love Sarah J. Maas so much—she writes every character with a depth and realism that is usually reserved for the main character. All of her characters have main character potential. Her romantic interests don't just exist for shallow swooning. Her side characters aren't just props to support the main character. 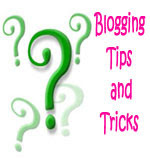 They don't exist solely for the purposes of advancing the plot. They are fully fleshed out people who happen to cross paths with the main character while going about their own off-screen story. Ok, ok, Sarah J. Maas is an auto-buy author, regardless of what series she's writing. I get it. I won't resist again. Just take all my money, ok? All of it. Just please keep writing these books that feel like they're ripped from my very soul and heart and encompass all my readerly desires. Ok? Thanks.